My hubby said I am a perfectionist. I am not too sure about that. But one thing I am sure is that I am very fussy in doing the right way, or should i say my way? Just talk about Julie's fullmoon giftpack, in order to get the fullmoon giftpack that I wanted, I've inquired from quite a number of suppliers. From the content to the packaging, I need everything to be just the way I wanted. But at the end, I decided to make my own fullmoon giftpack due to none of them can pack as the way i wanted. I've prepared most of the packaging stuffs myself during my confinement. That includes cutting the ribbons into desired length, cutting the 'Especially For You' gift card and 'With Love' label. And I even went out sourcing for the box and ribbon during my confinement period. I know I can always ask my hubby to source for the box and ribbon without me, but I wanted to see for myself and decide which box and ribbon color is the most suitable. My elderly will surely scold me if they knew I went out. Hopefully they are not reading this - *crossing my fingers*. So with everything prepared, it should be very fast on the actual day of packing, or so i thought. 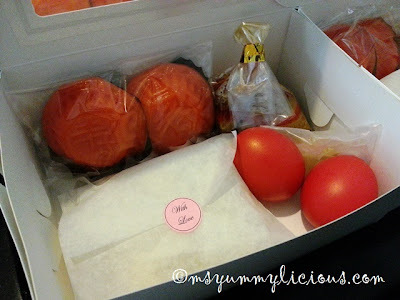 Early morning on that day, my hubby went out to collect the nasi kunyit and red angku kuih. My confinement lady helped to make the red eggs. When my hubby was back with the food stuffs, we start packing. 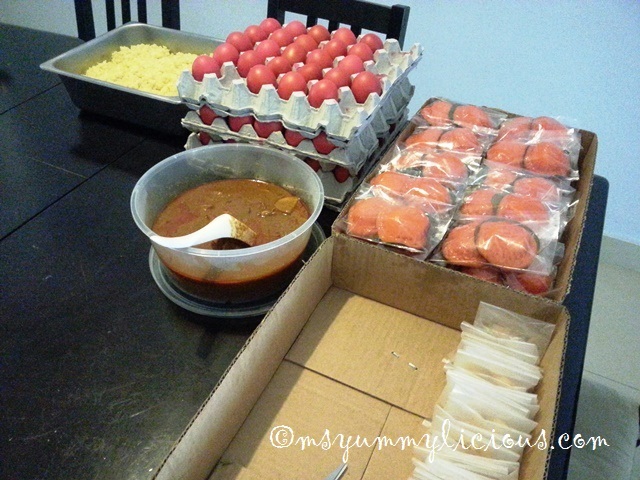 My mom helped to packed the red angku kuih and pickled ginger into individual plastic bag, while my hubby packed the curry chicken and I, packed, wrapped the nasi kunyit and do the finishing touch on the packinging. All ready to be packed! Nasi Kunyit : Wrapped with a plastic before wrapping with baking sheet and sealed with a 'With Love' label. Curry Chicken : Tied with a rubber band then sealed with gold tape. Red Angku Kuih : In individual plastic bag. Red Eggs : As it is. Pickled Ginger : In individual plastic bag. Packaging : White Box tied with a Cranberry Satin Ribbon and accompany with Julie's Birth Announcement Card and lots of love. We only managed to finish the packing around 2pm. Mom & hubby blamed it on my way of packing. They did asked during midway packing, "Why don't we just put everything inside the box without properly individual packed?" I said, "No, I wanted it to look nice so that the recipient will know that we have packed with love. This is a special gift from us!" I really hope that my relatives whom has received Julie's fullmoon giftpack will love this little gift from us! P/S : Read about Julie's fullmoon party here. So, the day has finally arrived to celebrate our little princess fullmoon. When i was still preggy with Julie, I have a lot of party ideas for Julie's fullmoon. I planned to invite all my relatives and friends, and make door gifts for the children. I have even planned on the color theme which is White & Pink and to decorate the house with beautiful white & pink tissue pom pom flowers. I was very excited and looked forward to this party. But since I can't get myself too hectic, we decided to do a small party instead, with just relatives from my hubby's side and few close friends. 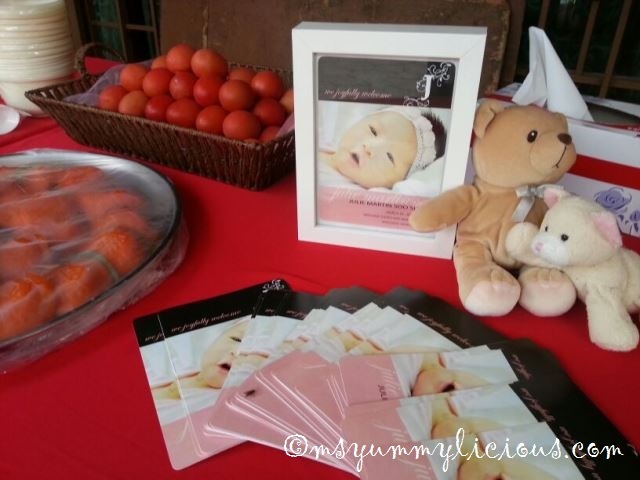 The initial party ideas will be used in Julie's 1st Birthday. ~ proudly designed by mommy & daddy (idea from tinyprints). Special thanks to Uncle Ray for sponsoring the printing. In Chinese tradition, red angku kuih and red eggs are served during the baby's fullmoon. We love BBQ and steamboat. What a great way to have both in a compact van! Both the hosts and guests had enjoyed themselves. White & Pink canopy with red table cloth. Even tho' my initial party ideas were not fulfilled but it was still great. At least, I still get my white & pink theme! And we had a great time fellowshipping over yummy~licious food! Yay, my long awaited parcel has finally arrived! 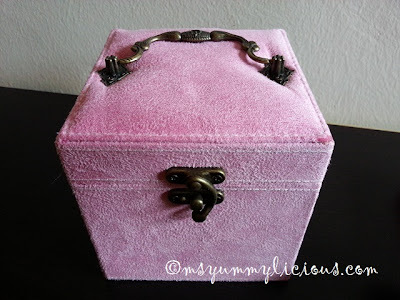 About a month ago, I saw this beautiful jewelry box at Milkadeal. It is a pinky jewelry box with just the perfect design & color for my vanity table. I did not hesitate to purchase it, right away i clicked on the 'BUY' button and filled in my delivery details. It was definitely a good buy! And the product that comes really fits the photo and description in the voucher. It's not like sometimes when we buy online, the product does not 100% match the photo and description in the site. This time, I am a happy and satisfied buyer. Milkadeal is an online site that offers daily deals and discount vouchers. It covers mostly on anything; from food, travel, beauty to kitchen products. It is one of the online shopping sites that i would often check out. My new pinky jewelry box. 3-tiers for varieties of accessories. Suede finishing with metallic lock. Here's how it looks like with all 3 tiers in the box. 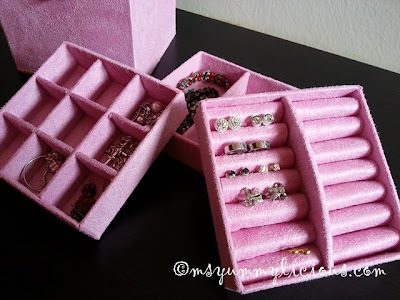 So compact & cute, rite? 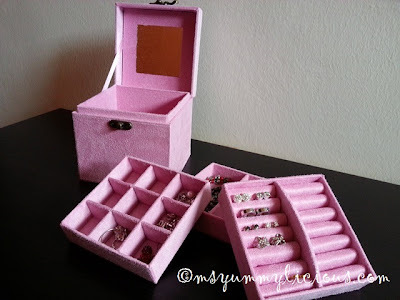 Now, will you excuse me, I would like to find more accessories for my new pinky jewelry box! Have you ever been to Puchong before? 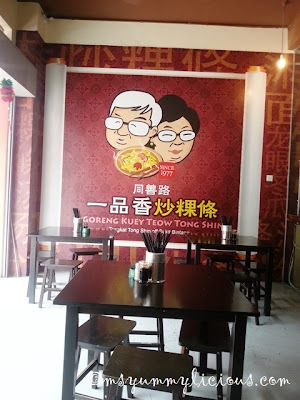 Puchong is one of the major town in Petaling district and it has developed tremendously over the years! Hypermarkets, residential areas, commercial buildings... you can see all these has developed and is developing in this area. It has also become a well known Food Paradise for many foodies! Even tho' I've been living in this area for almost 5 years now but there are so many new restaurants that we've never been to. New restaurants keeps opening, and there just aren't enough days for us to try one by one. 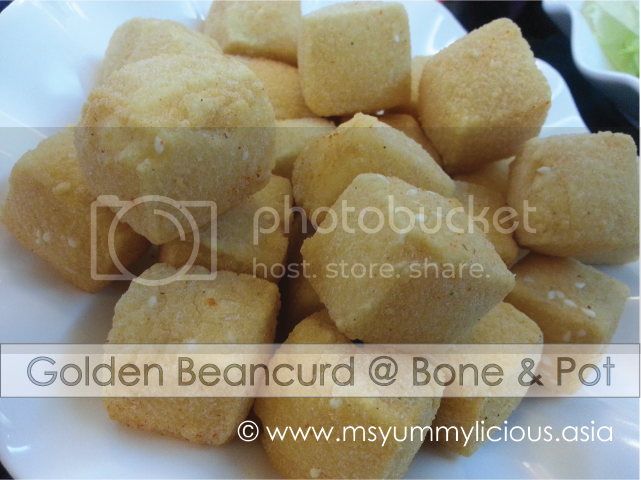 Today, I'm going to blog about a new restaurant that we went to 2 months back. 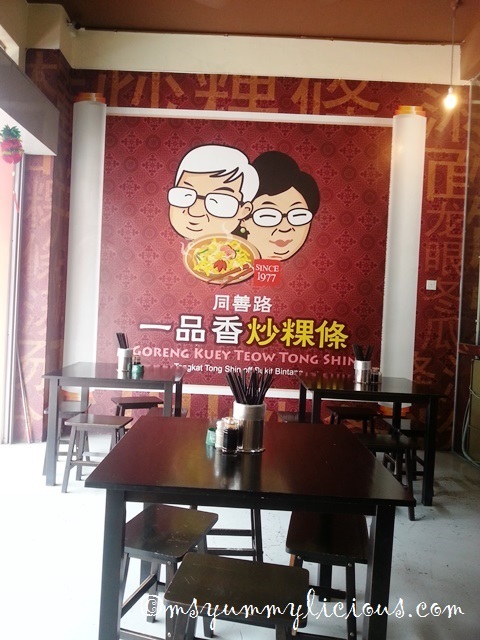 It is located in Bandar Puteri Puchong, called Goreng Kuey Teow Tong Shin (Tong Shin Fried Kuey Teow). 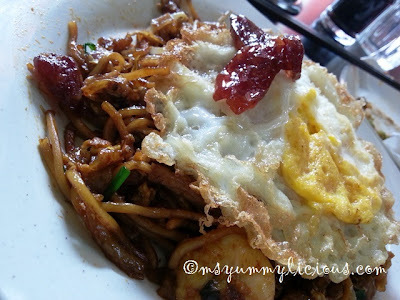 We love fried kuey teow. 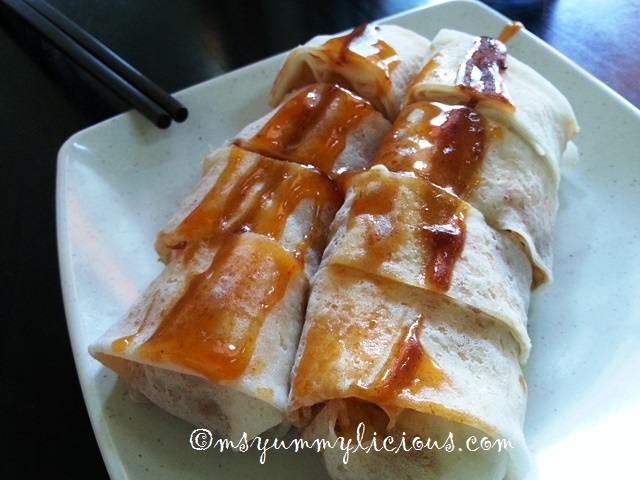 It is one of our favourite hawker foods. Clean & tidy ambiance with old kopitiam deco interior. 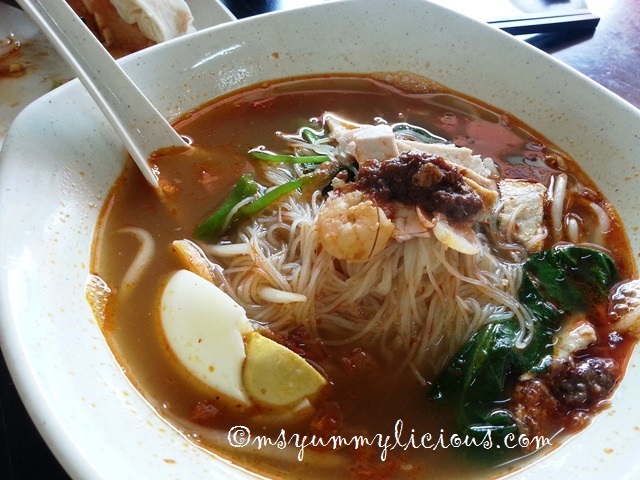 Besides their specialty, they also offers Prawn Mee and Lam Mee on the menu, not to mention there are also a few side dishes like the popiah. The fried CKT was lacked of 'Wok Hei'/ Wok Breath. 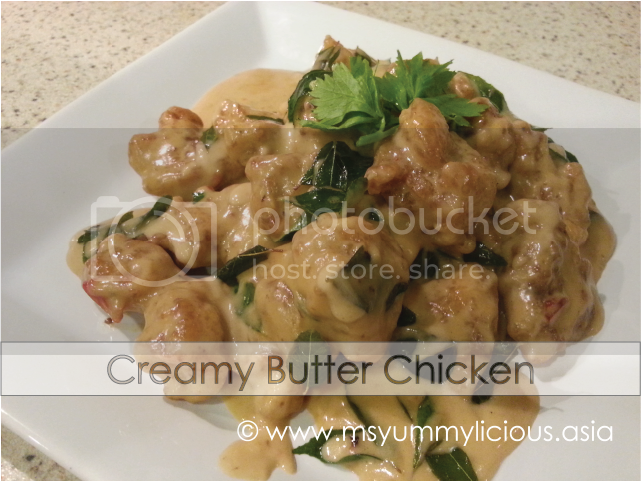 Even tho' my version of CKT was also lack of 'Wok Breath' but my hubby said my CKT is even better than this one. Overall, the dining experience was somewhat all right, credit all given to the good ambiance. The food is only so-so. If you see us coming back here again, it would be because of the ambiance. But I doubt that we would come here again! Julie has been crying a lot yesterday. And her cries were for no reason. I tried everything but it seems like yesterday was just her 'Crying day'. She also refuses to sleep, only sleeping 10mins before starting her crying again. I was worried that she might be feeling unwell. But I've checked, no illness that i known of. 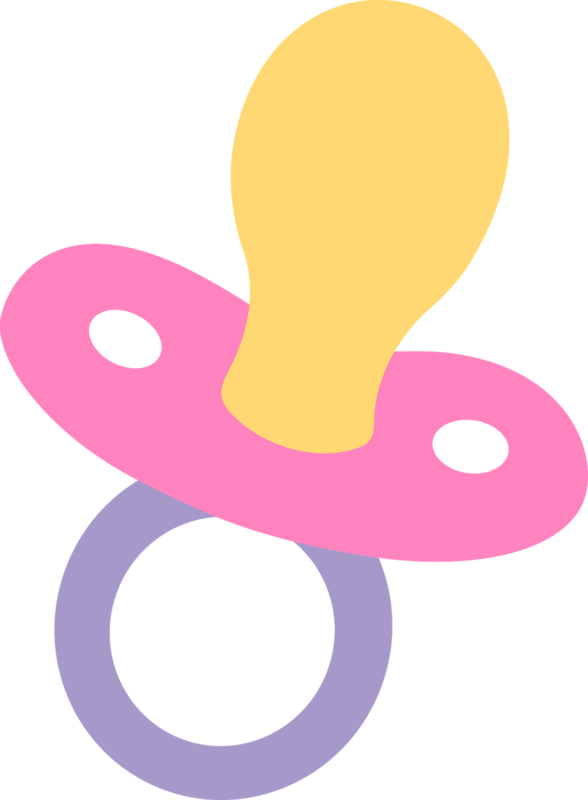 I read in the internet that some babies may get cranky when they are overly tired. So, that's the reason to her crying huh! Finally, at around evening, she slept for 2 hours straight. After her feeding, she slept again. I hope she will get back to her 2-hours sleep cycle. I am so worn out now and I don't think i can handle another of her 'Crying day'. I really need some soothing, relaxing song to help me destress myself now. Here, let us relax our soul with this song from Olivia Ong. Yup, you have heard me right! 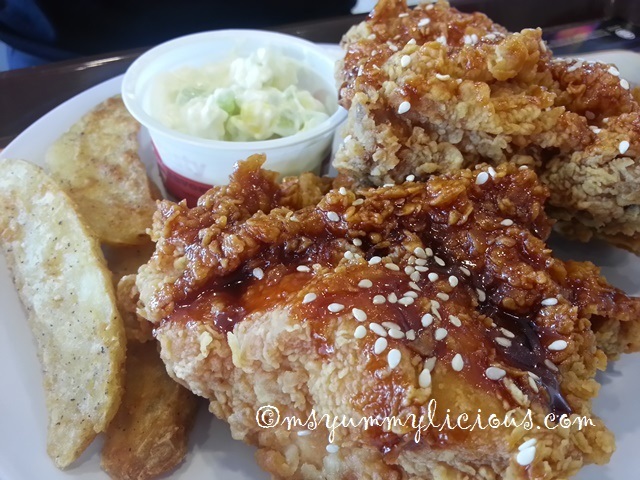 Let me bring to you the new menu from KFC, the Spicy Korean Crunch!! Needless to say, the Spicy Korean Crunch is really spicy and crunchy as its given glamorous name. You guys should try this! The potato salad is yummy too! Two pieces of hot & spicy chicken toppled over with spicy korean gravy and compliment with wedges, potato salad and a carbonated drink. 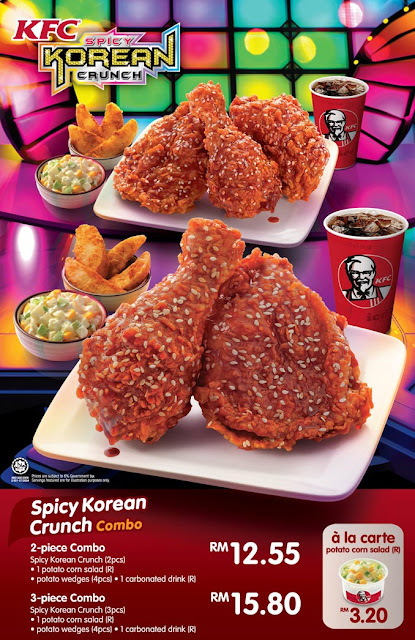 Disclaimer: The above illustration is taken from KFC official website. 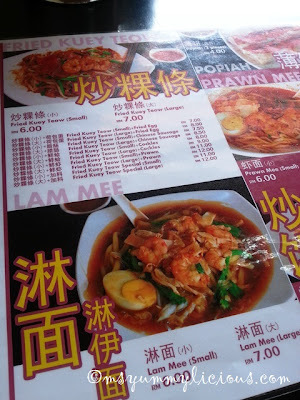 The set comes with yee mee, meehoon and eggs. 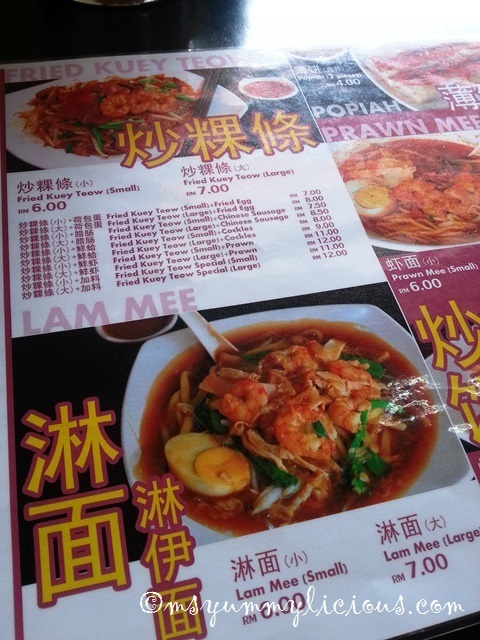 But we exchanged meehoon with another yee mee.